This isn't what I was expecting. When I think of Andrea Beaty I think of Attack of the Fluffy Bunnies! Oh, and the Ted picture books. So, going into this and looking at the cover (which in my version has a "From the author of Attack of the Fluffy Bunnies" blurb), I was thinking Attack of the Fluffy Bunnies (which, in case you don't know, is about alien rabbits, Spam, and marshmallows). However, it turned out this was much more bildungsroman middle grade. It was hard for me to judge it objectively, since it was like expecting ice cream and getting pickles, you know? 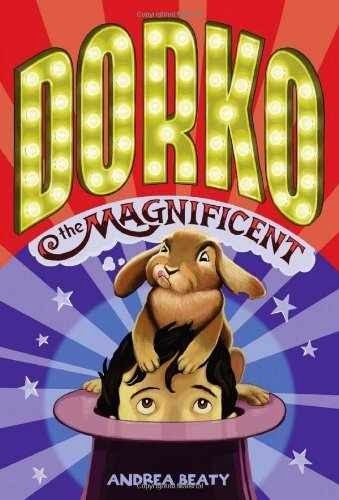 Robbie Darko is obsessed with being a magician. Unfortunately, his tricks don't always work out the way he expects. He's got plenty of family issues to deal with too - his horrible Grandma Melvyn (really a great aunt) has moved in with his family while she waits for knee surgery, which means that he's stuck sharing with his annoying younger brother. His mom is tired and stressed all the time and his dad travels constantly. Nobody in the entire fifth grade has forgotten his last disastrous trick and his only friend is Cat, who's a bit kooky herself. Robbie is, for most of the book, very self-absorbed. Even when he pretends to himself he's helping others, all he really wants to do is work out his magic tricks and get an audience. In other words, pretty typical fifth grader. However, as he gets to know Grandma Melvyn, he gains some empathy for her and for his family and starts to grow up. Just when things are going well though, Grandma Melvyn gets some tragic news. I just don't know what to think about this. On the one hand, it's got lots of magic tricks and embarrassing, ridiculous moments. On the other hand, the cover (to me anyways) promises non-stop hilarity and it's actually a pretty serious book with all the problems Robbie's family is having, his inability to see anyone's point but his own, and SPOILER Grandma Melvyn's death at the end. Verdict: I think it will appeal to fifth graders who don't feel they're too sophisticated yet, but it's really a little old for the cover and for readers younger than fifth grade and most fifth graders and older kids won't like the more childish elements. Bildungsroman! One of my favorite words. I got this at a "book look" which means I didn't have to pay for it. It's done better with my 6th graders than I thought it would. They seem to LIKE the cover. Huh. Well, that leans me more towards the getting it camp.